The Egyptian authorities have lifted all diving restrictions in the Red Sea resort of Sharm el-Sheikh following the shark attacks earlier this month. But the tourism ministry said a ban on swimming and snorkelling was still in place along a 3km (2-mile) stretch of beach in the main resort area. Meanwhile, an environmental group has accused officials of "indiscriminately" killing at least 10 sharks. The South Sinai deputy governor has denied any large-scale shark cull. "We don't kill sharks," the Deputy Governor for South Sinai, Ahmed Saleh, told the BBC. "Only one, or maybe two or three sharks have been caught, but not killed. Maybe they died after they were caught," he added. Earlier, the director of the Hurghada Environmental Protection Agency (Hepca), Amr Ali, told the BBC that he had received photographs of 10 sharks killed by the authorities. The group accused Egyptian officials of attempting to "wipe out local shark populations", but said the killing appeared to have stopped in recent days. In early December, the authorities released photos of two sharks they captured which they believed were responsible for the spate of attacks. Sharm el-Sheikh is one of the world's top diving destinations and there are fears the shark attacks could hurt Egypt's lucrative tourism trade. Deputy Governor Ahmed Saleh said that 23km (14 miles) of coastline was safe for all watersports. But he said swimming and snorkelling were still banned in the 3km from North Naama, Sharm el-Sheikh's main centre, to the resort's second busiest hub, Ras Nasrani, pending further investigation by scientists. A 70-year-old German woman was killed and four other tourists injured in a highly unusual series of attacks earlier this month. At least two species of sharks carried out the attacks, experts said, suggesting that environmental factors were likely to blame. 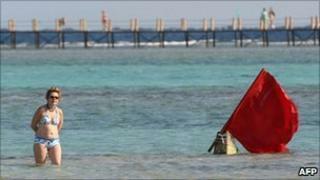 The Egyptian government is keen to protect the tourism industry, which generated revenues of $11.6bn (£7.3bn) in 2009. What is making sharks attack?